Experience the feeling of true physical freedom when you're able to pop up into a handstand anytime, anywhere. The handstand is perhaps the most honest expression of full body integration - strength, mobility, and balance all coordinated together. This ability (full body integration) is the keystone for total health and athleticism. The bones/tendons/ligaments in your hand/wrist are tiny, and they require daily nutrients to help them grow. Of course, they grow pretty slowly (especially bone). So if you haven't been putting your ENTIRE BODYWEIGHT on just your wrists/hands regularly since you were a kid, it's IMPERATIVE that you spend just a little time on wrist prep. Lack of joint prep is the TOP reason people fail to achieve a solid, pain-free handstand. Do these simple, easy drills DAILY, and you'll be amazed at how much better your handstands feel. As a bonus, every single one of your non-handstand lifts will go up due to the increased strength in your hands/wrists. There are a lot of ways to perform a handstand, and the one I see all-too-frequently is the floppy core handstand. A solid handstand requires 360 degrees of core stabilization, which is something that few ab exercises even come CLOSE to achieving. Learn how to make the anchor point (and your center of gravity) strong and stable. Once you light up your core the RIGHT WAY, you'll be amazed at how strong everything becomes, and how much easier handstands are. The handstand is a skill that you can play with throughout, the rest of your LIFE. So it baffles me when folks try to nail a handstand in one day without doing any of the necessary prep work. Now, understand something here: If you do the drills in this video, you'll likely be ABLE TO do a handstand within a couple days. HOWEVER, that's really not the best idea. There are drills to work in this course that will save you months (or even years) of handstand suffering. DO NOT RACE TO THE FINISH LINE. ​The handstand is a metaphor for your life. As your handstand skills improve you'll find that the focus and meditation you receive from the practice becomes a part of your life that you always look forward to. You lay a solid foundation. You practice the basics, and you approach every day with a fresh perspective. Getting inverted is a great perspective change, by the way. You try to race to the end-point, you might hurt yourself, AND you'll have missed out on enjoying the journey. Don't rush through handstands, and don't rush through life for some magical endpoint. Your handstand is completely your own, independent of any other handstand. Enjoy the process, and enjoy seeing the changes in your body and athleticism. 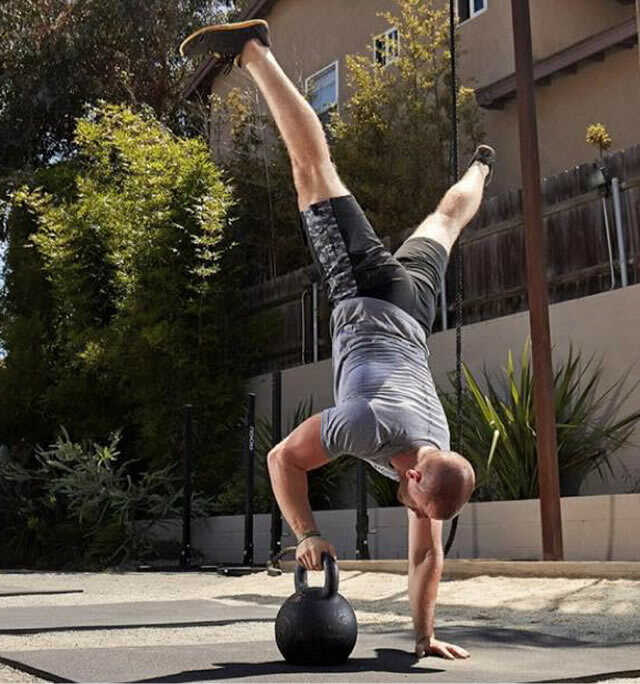 ​Even though handstands are going to make your shoulders pop out of your shirt, it's best to treat it like any other SKILL. Archery, darts, golf, etc. You'll probably be tempted to try to "get a workout" during handstand practice. Don't do it. You can drag a sled, and crawl a mile if you need a workout. Explore your handstands with fresh energy and enthusiasm, not fatigue and exercise punishment. I've seen time and time again, people skip handstand prep. It's better to do something than nothing. In my course I go over a quick and dirty handstand sequence that will get you off to a strong and pain-free handstand session in no time. Make sure you have a quick go-to prep sequence to get you inverted as quick as possible - but never skip the prep. Focus on the big ones: Hands, wrists, elbows, shoulders, spine, core. As I covered in the top mistakes, the importance of 360 degree core strength should not be ignored. In this course you'll learn the ideal alignment drills to give you 360 degree core strength. Your core is your primary anchor point, and if it doesn't stabilize the pelvis and spine, the neighboring areas will try to pick up the slack. This causes huge problems, of course. Strengthen your core (the right way) and reap the huge benefits of a stronger and more pain-free...everything. Upon purchase, you will receive your receipt via email (be sure to check your Junk email folder), which will include access details. You will log in at maxshank.com/login to access all included materials. If you already have an account with the same email address, this purchase will be added to your existing account. I'm asking that you give this a try for at least 60 days. I want you to ACTUALLY follow the program--it works! However, if you aren't completely satisfied AFTER 60 days, just send me an email and tell me about your experience and I'll be happy to refund you in full. Not only that, if you email me and explain what you did, and how it didn't work for you, I will PERSONALLY give you my best recommendation on how to move forward on a case-by-case basis.